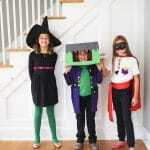 I think this is the most fun yet we’ve had working together to make a DIY Halloween costume. The girls are getting old enough to help with ideas and love working on these with me. 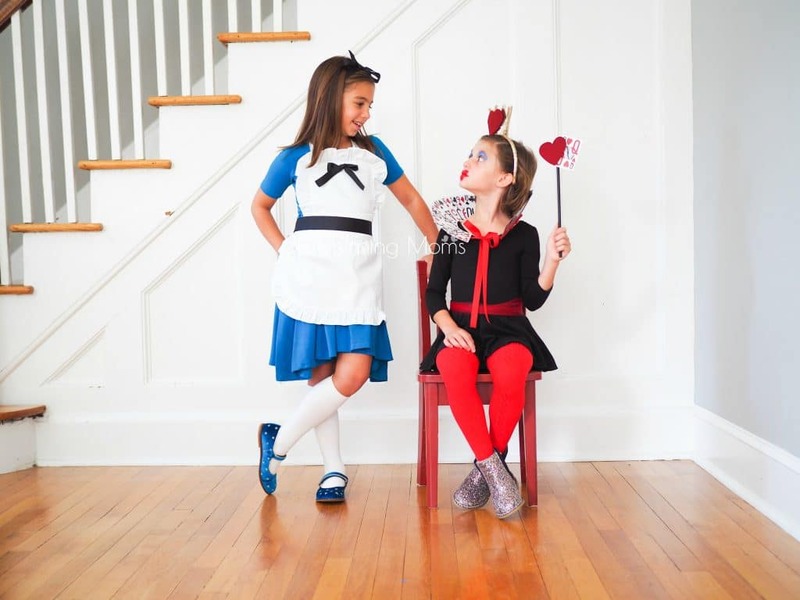 The best part of these 2 costumes: you probably have a lot of the supplies already. 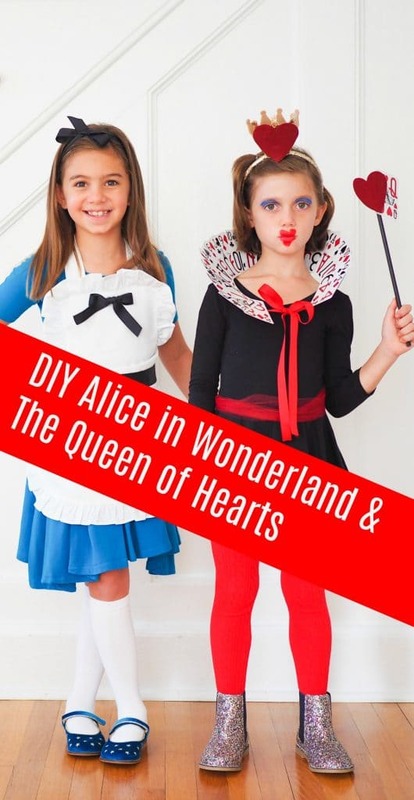 We made this DIY Alice in Wonderland costume and DIY Queen of Hearts costume with things we had at home by adding a little ribbon, felt and makeup! 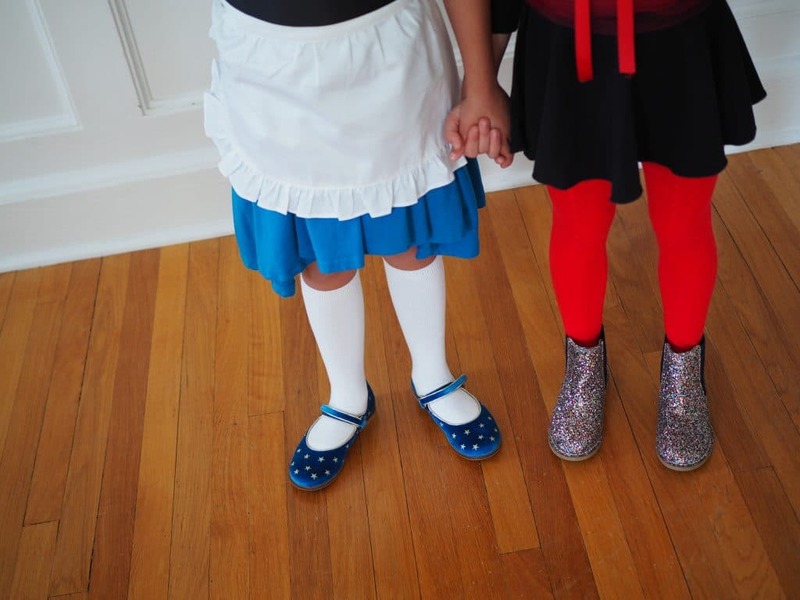 We started with our favorite blue dress and black leotard, both from Alice and Ames. 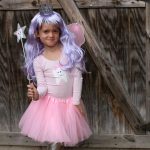 My kids like costumes that are comfortable, so starting with soft basics they wear all the time was key. 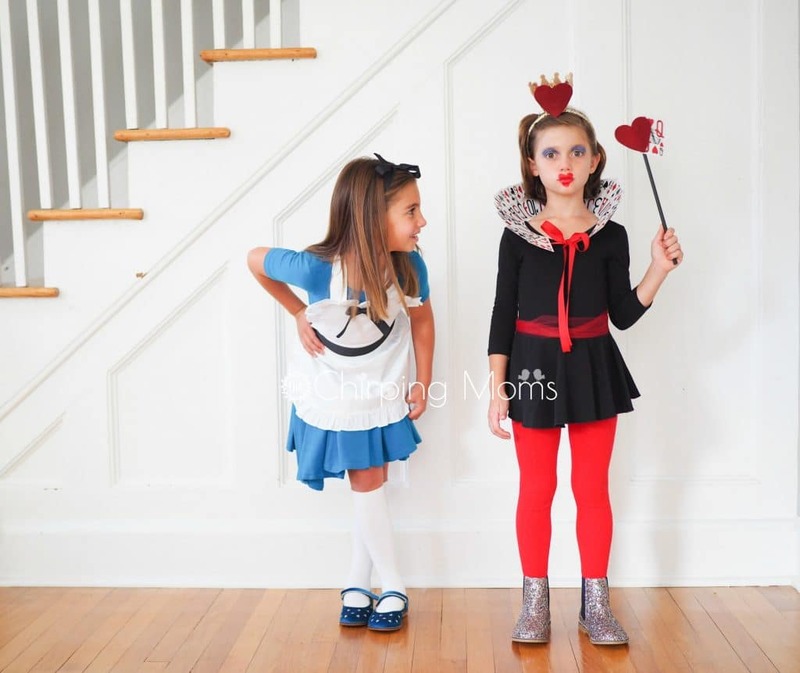 Then we got to work adding to the dress and leotard until we thought they looked just like Alice in Wonderland and the Queen of Hearts! 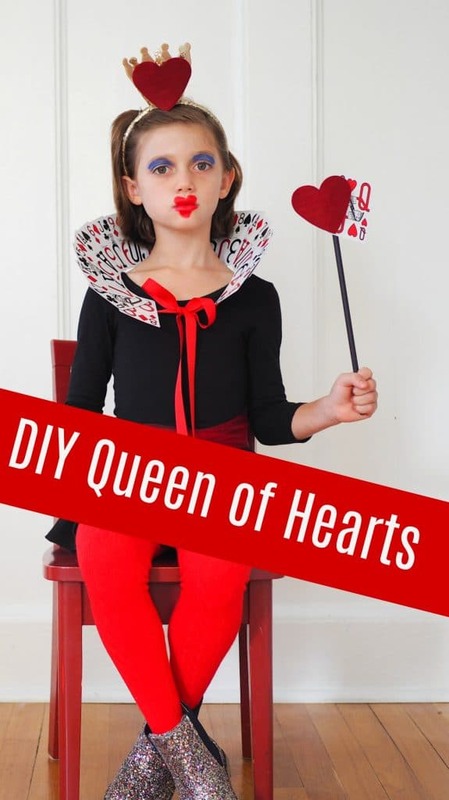 How to Make a Queen of Hearts Collar: OK this is A LOT easier than it looks. Simply spread out the deck of card in an arch (picture lining them up in the shape of a rainbow). Do not use Queen of Hearts card (we’ll need that later). Then lifting one card at a time, put a drop of hot glue and press down. If it feels flimsy after, flip it over and add some more hot glue. Next cut a piece of ribbon longer than the arch of cards. It should be about 12 inches longer on EACH side. Glue the ribbon the the back side of the arch of cards. You want it towards the bottom of the cards. Once dry, simply tie the arch around your child, tying the ribbon in a bow. It should be stiff enough that it stands up like this. 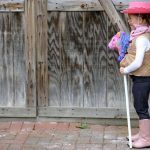 The Queen of Hearts Wand: I painted a wood stick from the craft store black. 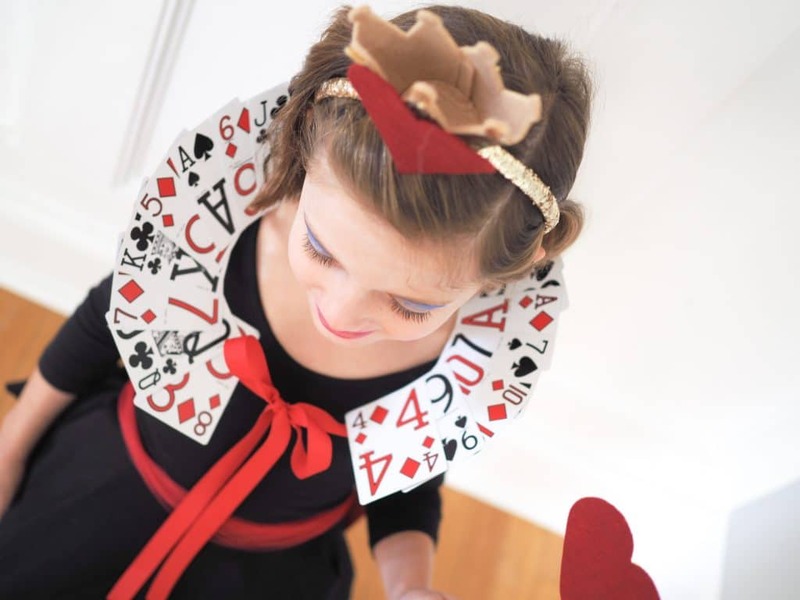 Then on top we glued a Queen of Hearts card and another felt heart. 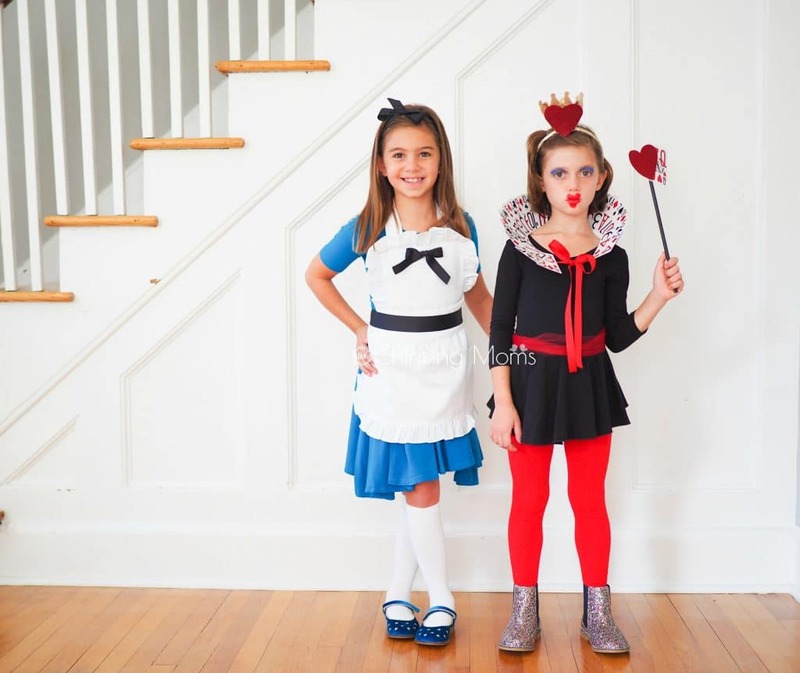 Queen of Hearts Makeup: This was my girls favorite part! I am not great with makeup or face paint. For this, we searched “Kids Queen of Hearts makeup” on Pinterest and I did my best to do my daughter’s makeup while looking at the photos. How to: We simply tied a black ribbon around the waist of the apron. We used a wider black ribbon for this but not necessary if you want to just buy one spool of ribbon. Then we used a more narrow ribbon to tie a small bow and then safety pinned it onto the top of the apron. Then we cut another piece of ribbon and tied it in her hair.